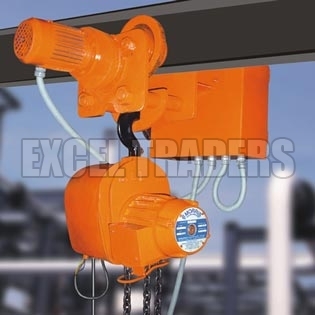 We are specialized in the supplying of Electric Chain Hoist (Bradys) in all over the country. The Electric Chain Hoist (Bradys) is procured from the well-known sources to ensure its reliability. The Electric Chain Hoist (Bradys) is made from the finest materials in compliance with the set industry standards. Hook suspension is available for all capacities and all hook suspension hoists can be hung into Morris push pull trolleys or hand geared Travelling Trolleys or Electric Trolleys.